This was supper tonight along with leftovers from the Lemony Orzo that I made the other night and dessert was Sopapilla Cheesecake. These shrimp are just mildly spicy. We heated up the marinade and put more on the shrimp and also some on the Orzo. Yum! This makes 6 servings. Soak skewers for at least 30 minutes. Thread shrimp onto skewers, and place in a baking dish. Pour Jalapeno Vinaigrette over shrimp. Marinate in the refrigerator for at least 2 hours. Preheat grill to medium-high heat (350 to 400 degrees); spray grill rack with nonstick nonflammable grill spray. Place skewers on grill rack over direct heat. 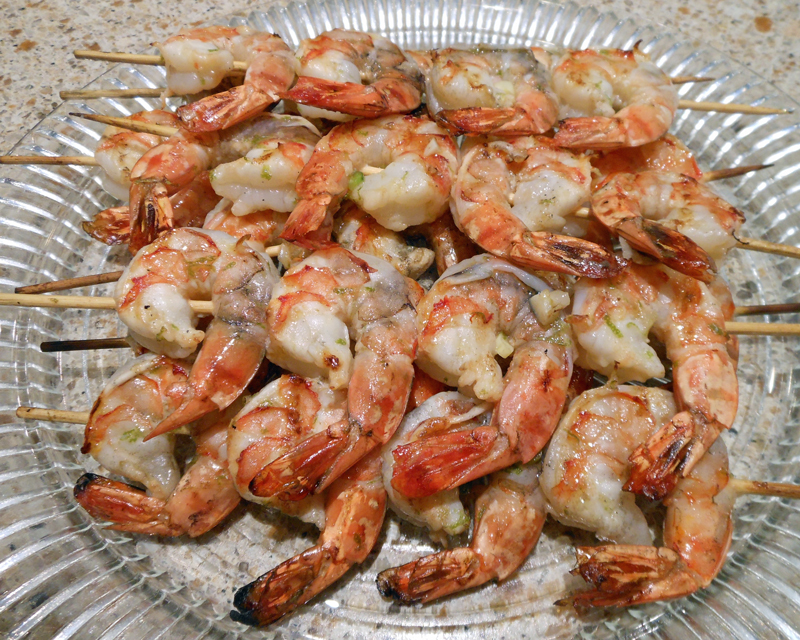 Grill, uncovered, for 4 minutes or until shrimp turn pink; turn skewers, and grill for an additional 4 minutes or until shrimp are done. Cool slightly, and serve immediately. Garnish with cilantro and chives, if desired. In a small bowl, whisk oil and vinegar until smooth. Add green onion, zest, jalapeno, shallot, garlic, salt, and pepper, whisking to combine. Store, covered, in refrigerator up to 24 hours. Before using, let mixture come to room temperature, and whisk until smooth.